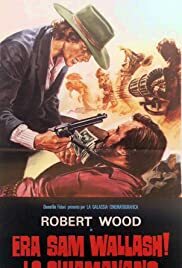 Spaghetti westerns that need a Region 2 DVD release. Dangerous experiments are turning the citizens of a small town into dangerous creatures or rather zombies. Some gangsters, which have nothing to do with the experiments, are fighting against them. This is one of the films that killed the "spaghetti" western. It not only loses something in the translation, it is a total chaotic mess of editing as well. Either chunks of it have been edited out and or re-edited for an English language version. In any case, it makes little or no sense, period. It makes the "Trinity" and the Eastwood "Man With No Name" films look like John Ford/John Wayne by comparison. Nothing in this film is original. Somewhere in there is a beginning, a middle, and (finally)an end. Except for the end, not everything is exactly in that order. Robert Wood seems personable enough. The rest of the cast, especially the women, should have made better career choices.